Everyone loves summer, and it is certainly here! The warm sunny weather seems to put everyone in a good mood: and whether you have been addicted to the recent excitement of the World Cup, or prefer Wimbledon or perhaps the Tour de France, there's been plenty to entertain everyone. However, if you run a small business you will know only too well how it is affected by the changing of the seasons. For many businesses summer is their busiest time: no easy living here! 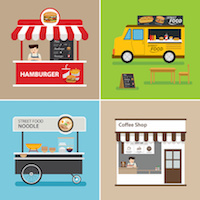 First of all there are the many small businesses that are either predominantly seasonal or that have increased demand for their product or service during the summer months. Businesses such as holiday companies, pubs and cafes with outdoor areas, gardening, agricultural, outdoor sports - the list is endless! But as well as the kinds of business listed above, so many more are affected in various ways by the summer. Summer - especially with the good weather we have been having - means that people are out and about a lot more than they would normally be. So this can have a knock on effect on their eating patterns: the type of food they choose to eat, the times they eat, where they shop - all of these can be changed by the lighter warmer evenings. People may also be willing to travel further to go out for the evening; so fuel sales, public transport and taxi firms may all potentially benefit. Of course the other major event of the summer is that schools are closed for a few weeks. Families are likely to be travelling both in the UK and abroad for holidays. They are likely to do lots of last minute shopping before going on holiday - so retail businesses will benefit - and will also need various services related to the holiday such as transport, improved phone contracts, camera equipment and home-related services such as house sitting and animal care. But there’s more! School holidays also mean that the staff who work in schools are going to be around more in the day for activities such as shopping and entertainment. They will also be trying to fit in all those appointments and jobs that are not possible during term time; which could have a positive impact on a range of services from hairdressers, beauticians and dentists to handymen, decorators and builders. Put together all of the above with the fact that many employees - particularly parents - ask to take time off during the summer, and it looks as though you have a very busy time ahead of you! If you need help with your business this summer, perhaps in terms of a small business loan to help you gear up for the autumn and winter, then do get in touch with us at Fair Business Loans. We love to help small businesses flourish and grow whatever the season. In fact we have £2 million of funding waiting for businesses just like yours!! So don’t delay: get in touch with Fair Business Loans now to see how we can help you move your business forward this summer.